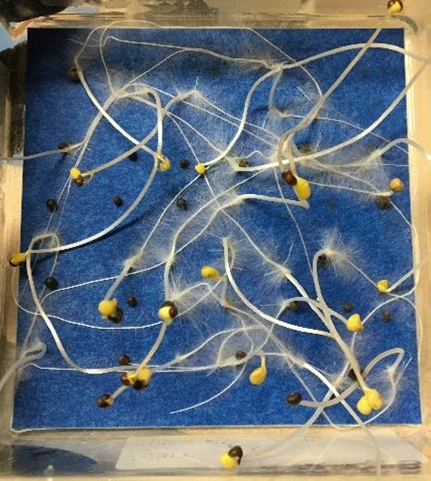 A seed will use this induced – or ‘secondary’ – dormancy to protect itself from germinating in conditions when it may not have enough time to complete its life cycle and reproduce. Temperature is very important for inducing dormancy in volunteer canola and other weeds. Light conditions or a lack of oxygen will also induce dormancy. For canola, exposure to low soil moisture conditions and warm soil temperatures over a period of several weeks best induces seed dormancy. Because canola is a common crop and because canola harvest losses are relatively high (4,000 – 6,000 seeds/m2), volunteer canola is consistently identified as one of the top weeds of the Canadian Prairies. This can have issues for crop rotation as a tool to manage clubroot. Volunteer canola is quite competitive with other crops and the presence of it in a field during a ‘non-canola year’ means that that field isn’t getting a true break from canola. Volunteer canola growing in your rotational break year away from canola will actually increase your clubroot spore concentration rather than reducing it as a break year should. Clubroot-resistant (CR) volunteers could also erode the effectiveness of our limited CR sources much more quickly. In addition, canola volunteers can pollinate each other and cause issues with herbicide resistance. They can also be an issue in rotations that include specialty canola. Different oil quality types in the same field can contaminate quality of the seeded crop. Does this same dormancy explain low emergence rates for seeded canola? Research continues in this area, but it seems to be a minor factor. While average emergence for canola in the Canadian Prairies is around 50%, recent research found that, on average, only about 2-3% of hybrid canola seeds planted in the spring could potentially go dormant. Bigger factors for low seed emergence rates are the environment, fertilizer toxicity, seed to soil contact, seeding depth or disease. We can’t control the environment, but we can alter management to minimize fertilizer toxicity and optimize seed to soil contact and seeding depth. The vast majority of canola seed sold in Canada is treated with a fungicide (and insecticide) seed treatment to minimize the effect of seed and seedling disease on emergence though we sometimes see early season disease issues in cold soils and tight canola rotations. When we talk about seeded canola not germinating we are probably mostly talking about quiescence – which is part of the environment factor. When dormancy is removed, but conditions for germination are not met (too dry, too cold, etc.) the seed is said to be in a quiescent state. Basically, the seed is ‘waiting’ for the right resources to be available. When conditions are right, then it will germinate. This is different than a dormant seed ‘deciding’ not to germinate until later.